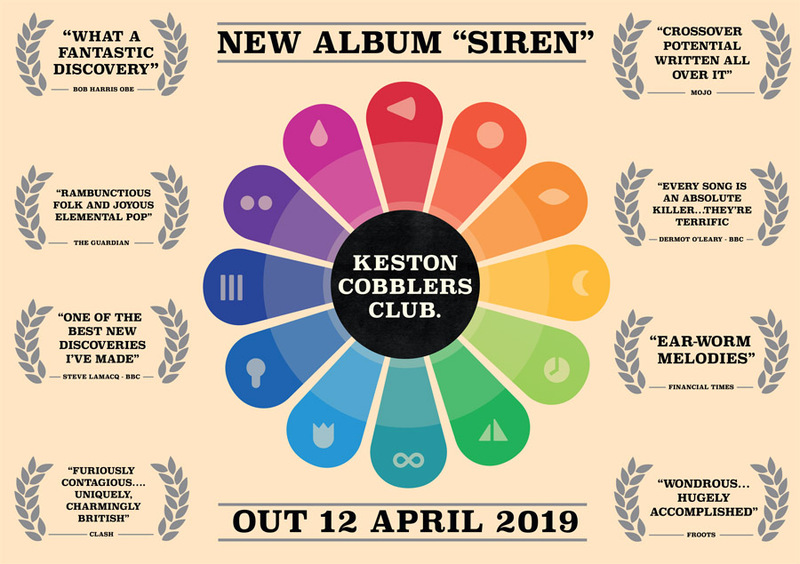 This spring, KESTON COBBLERS CLUB go back to their roots with their self-produced fourth album Siren, featuring the beautifully crafted folk sound with hook-laden melodies for which they are best known. The album is released on 12th April with a concert at Bush Hall – already a sell-out – at the end of a nine date tour, taking in Birmingham, Manchester, Glasgow, Bristol and Brighton. The album signals a big, bold return for the band, plus a nod to the Sirens of Greek mythology: a theme of love and escapism runs through the twelve tracks, which are represented through an enigmatic colour spectrum and by different symbols like signs of the Zodiac. Songwriting team siblings Matthew and Julia Lowe are joined in the performing line-up by multi-instrumentalist Tom Sweet and Harry Stasinopoulos on drums, with Daniel Slade on tuba. The album ranges from big, raucous numbers (Siren, Another Summer, Esta) to the stripped back (Swimming Pool, Eye to Eye, State, Here’s the Truth) to the idiosyncratic (Open Sesame, Want You, Library). As with all the Cobblers’ projects, each release of a single is accompanied by a lovingly produced DIY video – such as recreations of seaside scenes on vintage postcards found in Julia and Matthew’s parents’ loft for Esta (the name signed on the cards). Graphic designer Julia has created the artwork, animation and packaging for the album while Harry has overhauled the band’s website. The Cobblers have built an enthusiastic fan base through their honest, accessible lyrics, rousing arrangements, and the dazzling musicianship and infectious warmth of their live performances. Their independently released debut album One, For Words was followed by two EPs, ‘A Scene of Plenty’ and ‘A Pocket Guide to Escaping’. 2015’s Wildfire won huge praise everywhere from BBC legends such as Steve Lamacq and Bob Harris to critics in the Guardian, The Financial Times, fRoots and MOJO, while latest album Almost Home further increased their following through a supporting European headline tour. The title track from Almost Home has accumulated almost 4 million plays on Spotify. The band have not only delighted audiences at some of UK’s the biggest festivals including Glastonbury, Cambridge Folk Festival, Wilderness and Green Man; they set up their own annual outdoor activities festival, Camp Wildfire as part of creating the Wildfire album. They opened for Bellowhead on their 2015-16 farewell tour and were asked by Burberry to perform for a VIP audience at the fashion house’s Spring/Summer 2016 show. On previous tours, they have sold out Scala and their favourite venue, Union Chapel in Islington. The Cobblers have been invited to perform live on BBC Radio, and have been playlisted by BBC 6 Music and Amazing Radio. They have provided the music for a Ross Noble film and a song for Arthur Smith’s Edinburgh Fringe show. The Siren tour ticks off at the Red Lion Folk Club in Birmingham on 3rd April. The Cobblers will be supported throughout the tour by singer-songwriter Ralph Pelleymounter, who is also the frontman of eminent indie rock band To Kill A King.